How's it going? I thought I would finally share a layout I made for one of the Craft Warehouse Scrapbook challenges about 6 months back. For this one we were given a Teresa Collins chipboard embellishment (mine was the flower button) and a half sheet of the doubled sided Teresa Collins music note paper to use. I paired them with some other Teresa Collins 6x6 papers and some coordinating My Mind's Eye and Authentique scraps I had in the same colors. I used sketch #39 designed by Susan Stringfellow found HERE. I loved the simple, graphic feel of the sketch and how it looked paired with wedding photos. 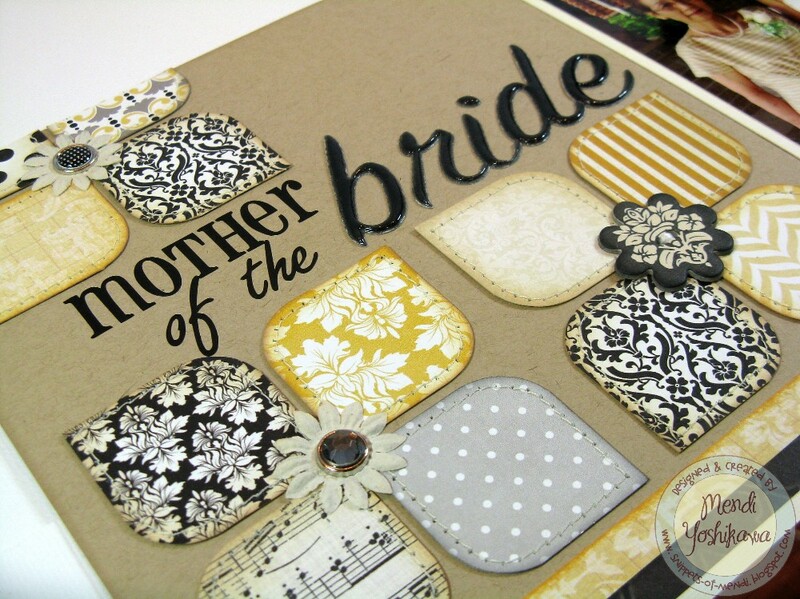 Even more, I love how it utilized so many small scraps of paper! Thanks so much for swing by. Hi Mendi! Great layout!! Love your blog too...so nice and bright! Thanks for stoppin' by! Mendi once again you have a gorgeous layout! I enjoy seeing your work as you are super talented my friend and you inspire me!